C.C. Humphreys was born in Toronto and grew up in the UK. He is the author of eight historical novels, including The French Executioner, which was a runner-up for the CWA Steel Dagger for Thrillers and was optioned for film. He has also acted all over the world, with roles ranging from Hamlet to Clive Parnell in Coronation Street. Humphreys presents Plague, a powerful portrait of 17th-century London—a place filled with battles and intrigue, where a serial killer stalks his prey, scalpel in hand. Andrew Pyper is the author of six novels, most recently The Demonologist, which won the International Thriller Writers Award for Best Hardcover Novel. His previous books include Lost Girls (a New York Times Notable Book), The Killing Circle (a New York Times Crime Novel of the Year) and The Guardians (a Globe and Mail Best Book). His forthcoming novel, The Damned, will be published in February 2015. Authors John Boyne, Nick Cutter and Lois Leveen read from their latest works at Station on the Green in Creemore. 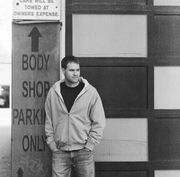 Craig Davidson is currently considered a "single author." If one or more works are by a distinct, homonymous authors, go ahead and split the author. Craig Davidson is composed of 4 names. You can examine and separate out names.